IEEE Transactions on Control System Technology, 2019, (accepted for publication). Beilstein Journal of Nanotechnology, 9 , pp. 490-498, 2018, ISSN: 21904286. 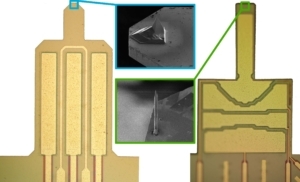 An important issue in the emerging field of multifrequency atomic force microscopy (MF-AFM) is the accurate and fast demodulation of the cantilever-tip deflection signal. 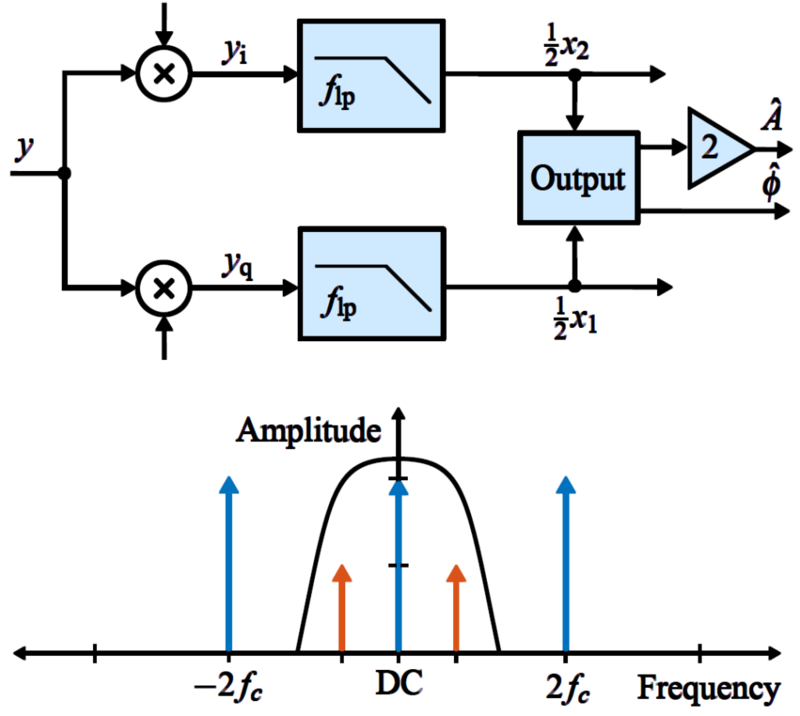 As this signal consists of multiple frequency components and noise processes, a lock-in amplifier is typically employed for its narrowband response. However, this demodulator suffers inherent bandwidth limitations as high frequency mixing products must be filtered out and several must be operated in parallel. 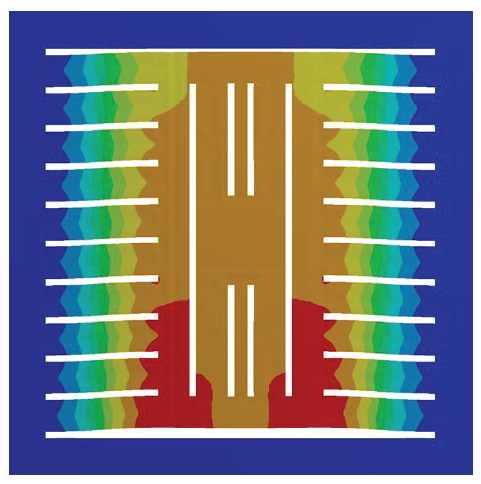 Many MF-AFM methods require amplitude and phase demodulation at multiple frequencies of interest, enabling both z-axis feedback and phase contrast imaging to be achieved. This article proposes a model-based multifrequency Lyapunov filter implemented on a Field Programmable Gate Array (FPGA) for high-speed MF-AFM demodulation. 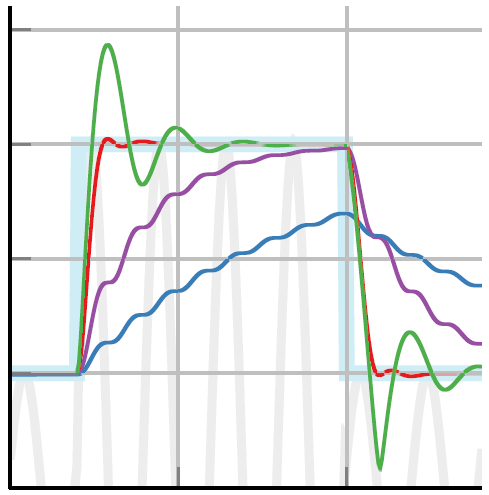 System descriptions and simulations are verified by experimental results demonstrating high tracking bandwidths, strong off-mode rejection and minor sensitivity to cross-coupling effects. Additionally, a five-frequency system operating at 3.5MHz is implemented for higher harmonic amplitude and phase imaging up to 1MHz. IEEE/ASME Transactions on Mechatronics, 22 (6), pp. 2611-2618, 2017, ISBN: 1083-4435. 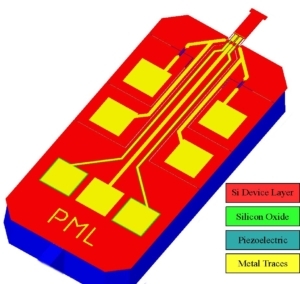 The article describes an XY nanopositioning stage constructed from flexures and actuators machined into a single sheet of piezoelectric material. 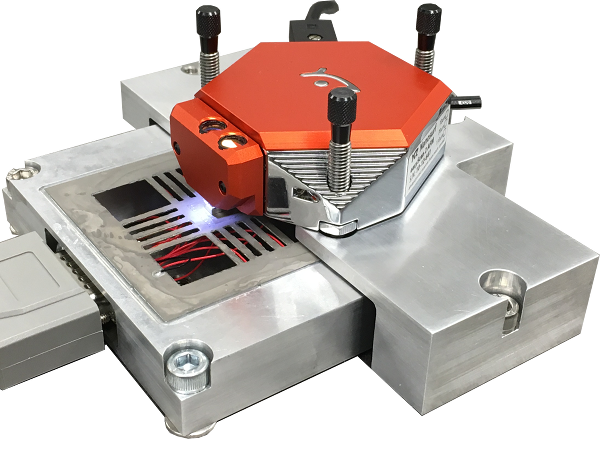 Ultrasonic machining is used to remove piezoelectric material and create electrode features. The constructed device is 0.508mm thick and has a travel range of 8.8um in the X and Y axes. The first resonance mode occurs at 597Hz which makes the device suitable for a wide range of standard nanopositioning applications where cost and size are considerations. 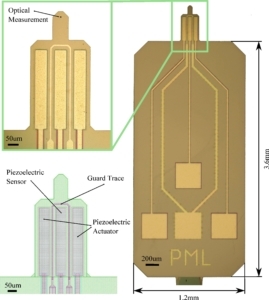 Experimental atomic force microscopy is performed using the proposed device as a sample scanner. Bellstein Journal of Nanotechnology, 8 , pp. 1407–1426, 2017. 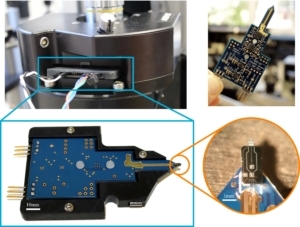 In this review paper, traditional and novel demodulation methods applicable to amplitude modulation atomic force microscopy are implemented on a widely used digital processing system. As a crucial bandwidth-limiting component in the z-axis feedback loop of an atomic force microscope, the purpose of the demodulator is to obtain estimates of amplitude and phase of the cantilever deflection signal in the presence of sensor noise or additional distinct frequency components. 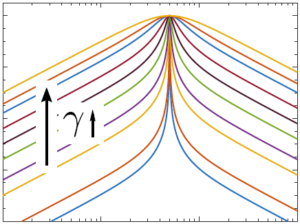 Specifically for modern multifrequency techniques, where higher harmonic and/or higher eigenmode contributions are present in the oscillation signal, the fidelity of the estimates obtained from some demodulation techniques is not guaranteed. To enable a rigorous comparison, the performance metrics tracking bandwidth, implementation complexity and sensitivity to other frequency components are experimentally evaluated for each method. Finally, the significance of an adequate demodulator bandwidth is highlighted during high-speed tapping-mode AFM experiments in constant height mode. IEEE Transactions on Control Systems Technology, 26 (2), pp. 765-772, 2017. In dynamic mode atomic force microscopy (AFM), the imaging bandwidth is governed by the slowest component in the open-loop chain consisting of the vertical actuator, cantilever and demodulator. While the common demodulation method is to use a lock-in amplifier (LIA), its performance is ultimately bounded by the bandwidth of the post-mixing low-pass filters. 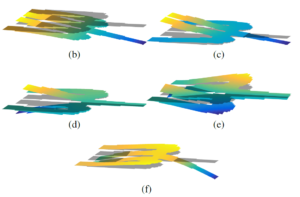 This article proposes an amplitude and phase estimation method based on a strictly positive real Lyapunov design approach. The estimator is designed to be of low complexity while allowing for high bandwidth. Additionally, suitable gains for high performance are suggested such that no tuning is necessary. 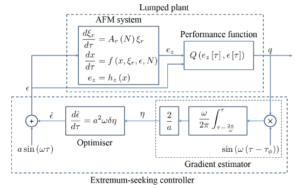 The Lyapunov estimator is experimentally implemented for amplitude demodulation and shown to surpass the LIA in terms of tracking bandwidth and noise performance. 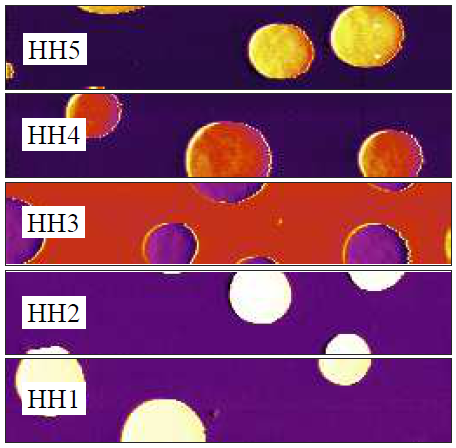 High-speed AFM images are presented to corroborate the results.